I’ve already droned on and on about how versatile risotto can be so I won’t re-bore you with those details. But it’s also oh so easy to fix, especially on a night when you need something to eat fast! Risotto for one is a staple in my life and it’s perfect for when the fridge is getting empty and both the pantry and my patience run low. 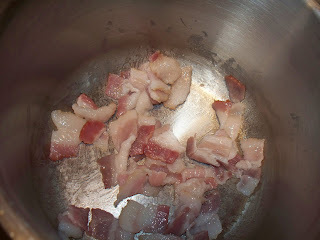 In a small to medium sized sauce pan, cook the chopped bacon over medium heat. After some grease appears add the onion and garlic and saute for a few minutes. 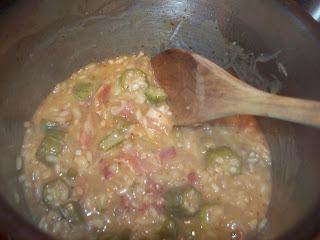 Add the dry risotto and stir the mixture together for one minute before adding the white wine. Stirring constantly, allow the risotto to soak up the white wine before adding chicken broth, one 1/4 cup at a time. Continue stirring and allowing the rice to soak up the liquid before adding more liquid. Rice will be plump and cooked through when fully done. Season with black pepper and stir in grated cheese and eat up! Dammit Jim, I’m a cook not a doctor! 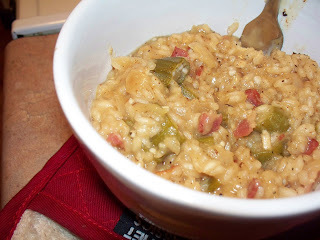 bacon, leah charney, quick meal ideas, risotto. Bookmark the permalink. Post a comment or leave a trackback: Trackback URL.